The warp speed of technological advancement – the internet, streaming, multi-platforming – happens to have coincided with the recognition of TV as an art form. So you have this incredible confluence of a medium coming into its own just as the technology for that medium is drastically shifting. 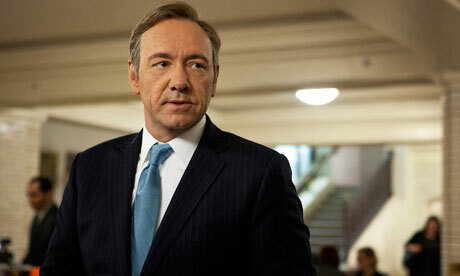 If there is anything about the character I play in House of Cards – Francis Underwood – that I suspect people admire it is that he has embraced a sense of total abandon. He has no allegiances to party, to titles, to forms, to labels: he doesn't care whether it's Democrats, Republicans, ideology or conviction. What he sees is opportunity and the chance to move forward. OK, he's a bit diabolical but he's also very effective. It seems to me that, like Francis, audiences are no longer making distinctions between television and other media, so let's throw the labels out. Or, as Francis might say, "at least let's broaden the definitions – and if we have to call ourselves anything then aren't we all just storytellers?" The success of the Netflix model – releasing the entire season of House of Cards at once and online – has proved one thing: the audience wants the control. They want freedom. If they want to binge then we should let them binge. And through this new form of distribution, I think we have demonstrated that we have learned the lesson the music industry didn't learn: give people what they want, when they want it, in the form they want it in – at a reasonable price – and they'll more likely pay for it rather than steal it. Well, some will still steal it, but I believe this new model can take a bite out of piracy.